Rate this Article If you have not heard of Poker Bingo yet, then this article is definitely for you - Do read on! If you’re looking for an alternative card game to your boys’ Texas Hold’em poker night, then now is the time to get on board with a new card gaming trend – Poker Bingo. Also known as Poker Keno, this game has taken the board game and iGaming industry by storm, due to its simplicity and similarities with poker. Poker Bingo can be played by up to 12 players, with 12 boards available in a standard board game set. Every player is given their own 5x5 board and some counters, except the dealer. The dealer has an ordinary 52-card deck at hand, turning over the top one and calling out the number and suit of the card. Players that have the card on their boards may cover it with a counter, just like a player would with a bingo card when one of their numbers are called. 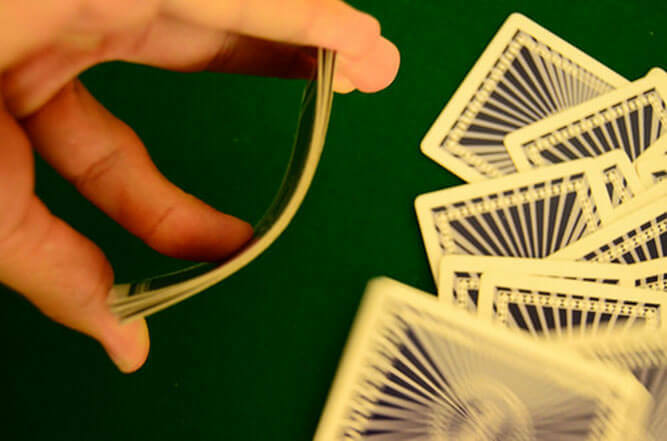 The dealer continues to call out cards one by one until a player has a complete line of five covered, either vertically or horizontally. Each board is arranged so that each line, both vertically and horizontally, represents a different type of poker hand, from a low-scoring pair to the highest-scoring straight flush. Once all players have a complete line of five, each player takes it in turns to reveal the strength of their poker hand. The player with the best possible hand wins the round. Mathematically speaking, each game board has the same percentage chance of winning the rounds. The best way to monetize this game is for each player to put in a specified amount of money for each round, with the winner of each line bagging the pot. By setting a limit on the amount players can put into the pot each round, this ensures that Poker Bingo is played responsibly. It is also possible to play Poker Bingo in the same fashion as blackjack, with the dealer having their own board and playing against all other players. The dealer keeps turning over playing cards until they have a completed line of five on their board. Those who don’t have five-in-a-row by this point or have a row of lesser value than the dealer will lose. In another variant of Poker Bingo, players keep the covered squares on their respective cards secret from each other and bet with one another based on the strength of the hands created by their covered squares. Players can check, bet, fold and raise just like in No Limit Texas Hold’em poker. Why do people enjoy playing Poker Bingo? Poker Bingo has become such a popular game among casual card players and online casino-goers due largely to its simplicity. Although it’s a fusion of poker and bingo, in all actuality, the game is more like bingo in the way it’s played. There’s no specific rules or strategy to learn. Players can just sit around a table and listen to the dealer from the word go. All they really need to know is the suits of cards, which even non-card players should be aware of. For those who need to learn the strength of poker hands in hierarchical order, 888poker lists them in an easy-to-digest page within their ‘How to Play’ section. Another reason for Poker Bingo’s popularity is that it allows more people to play than you’d normally get around a traditional Texas Hold’em table. If you’ve got a big group of friends round for a party, a game of Poker Bingo can help get the party started. As a pure game of luck, no player has a definitive edge, providing a game that can be enjoyed in a relaxed, fun manner. The plethora of game variations will also appeal to seasoned card players, who like to mix things up over time. Poker Bingo can even be played on the same principle as roulette, where players can stake on specific rows or columns during the round. Players only cover those rows or columns on which they wager. If either of the rows are not covered once 25 cards are turned over, the banker takes the wagers. Poker Bingo is just one of many different variations of the traditional game of bingo. One of the more popular bingo variants is Bingo U-Pick ‘Em, where players choose the numbers they want to win, in a lotto style. Horse Race Bingo is particularly good when played with large groups, as up to 15 players can play. Each player receives numbers from 1-15, which will correspond to the upper row of their bingo cards. Once a player lands five matching numbers within a column, they are the winner. Death Bingo turns the concept of bingo on its head completely. When a player gets bingo, they are eliminated from the game. The last one standing is declared the winner. Therefore, in this version, you don’t want the bingo caller to read out your numbers. The player with the most spaces left on their bingo card wins. This can be equally as exciting as waiting for a number to be called to win. There are also different forms of bingo games based on the number of balls active in a game. 75-ball bingo is particularly common in the United States, while 80-ball bingo is also a popular online variant. There’s also an increasing number of video slots being designed and modeled on the game of bingo. You’ll receive a bingo card with numbers on it and, as the bingo caller reads out the numbers, your card will be marked and pay out specific prizes and free spins based on how many numbers you land. On the whole, Poker Bingo is a fun way of keeping the games of poker and bingo fresh and exciting. If you want a light-hearted card game that requires minimal skill and lots of unexpected twists and turns, make sure you and your friends try Poker Bingo at your next gathering.